Ham and Swiss cheese are natural partners. The sweet and salty flavor of the ham is perfect with the slightly sweet and tart flavor of the cheese. When combined in a quiche, this combination is even more delicious. You could substitute 1 cup frozen broccoli florets, thawed and drained, for the spinach in Ham and Swiss Quiche if you'd like. Or use chopped cooked asparagus or even green beans. You could also use other types of grated cheese instead of the Swiss or Havarti. Cheddar, Colby, or Cojack cheeses would be good, as would Monterey Jack cheese. You can even make this quiche spice, with some Pepper Jack cheese. A quiche is simple a mixture of cream, eggs, and cheese, mixed with other ingredients and baked in a pie shell until puffy and golden brown. This simple recipe follows the usual formula. While you can experiment a bit with this recipe, it's best to stay without the boundaries of amounts set out. You can use a purchased premade pie crust, or make one from scratch. My Hot Water Pastry pie crust recipe is easy and foolproof and perfect with this mild filling. 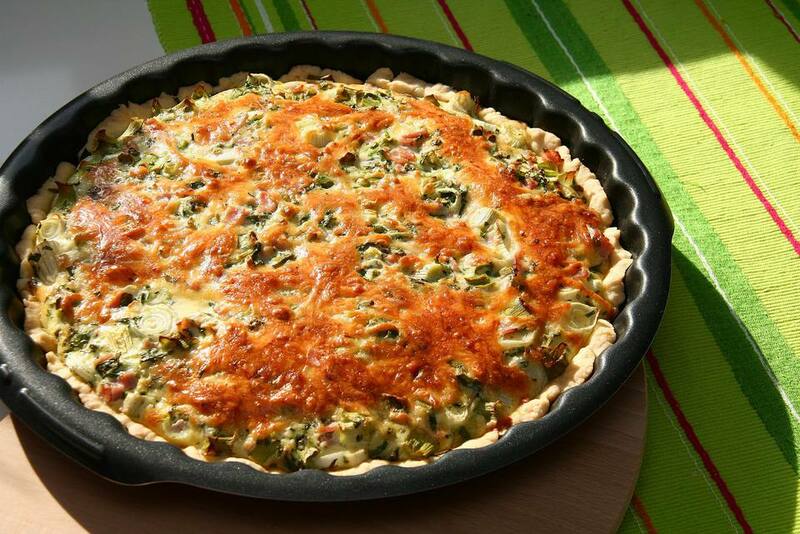 Once you know how to make a quiche like this, you can use it as a base for other ingredient combinations. Try shrimp, cooked cubed chicken, or leave out the meat altogether and make it a vegetarian quiche. In that case, use more cooked chopped vegetables in place of the meat. Serve this recipe with a green salad tossed with mushrooms and grape tomatoes or avocado, and some fresh fruit or a gelatin fruit salad. Some white wine, iced tea, or sparkling water to drink will complete this meal. Bake the quiche for 40-50 minutes until crust is golden and filling is set. Let stand for 5 minutes, then cut into wedges to serve.